JULIO... Highly Proven..in the US, Netherlands & Switzerland! JULIO's dam Jill holds two current Br.Swiss World Records...TWENTY years later! High Components! BB Kappa Casein... the Best! First JULIO dtr. photo from Switzerland, scored VG @2yr. First U.S. Milking Dtr. VG(86)!! Denmark and of course the USA. 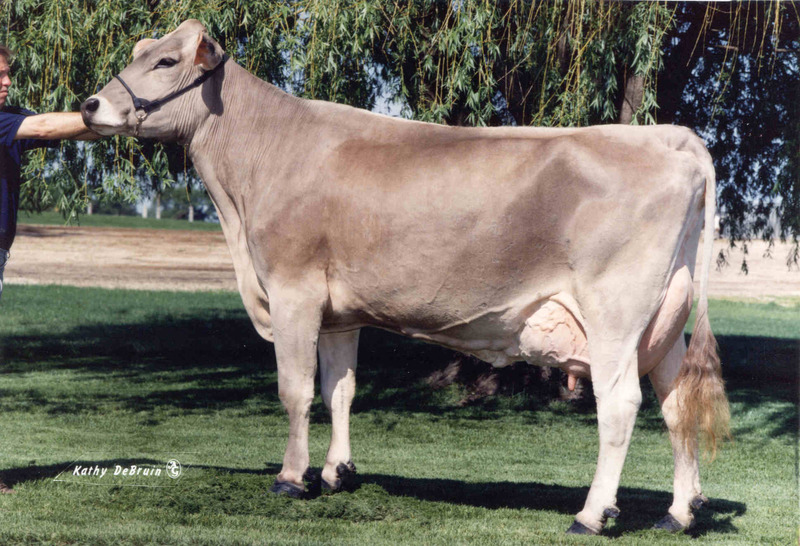 Very Good (88) EX(91) Dairy@ 6-06 "Former,Qualified Sire"
Nolandale Julio Jerrilyn GP(83) @ 2 yrs. JULIO, Jill's only son by EARNEST T, is straight-topped, strong and long, with correct set to the leg. His sire, EARNEST T, is SMA-free. JULIO is the highest proven Earnest T son in the world. His pat. grandsires, EMORY and TELSTAR, are SMA-free, and his mat. grandsire, PETE ROSE, is also SMA-free. JULIO is available around the world. He is a perfect mating for the typical Jetway or Collection daughter because he will improve production and protein, and correct the rump structure by lowering the pins. EARNEST T is an outcross sire. He's a former No. 1 sire for protein. 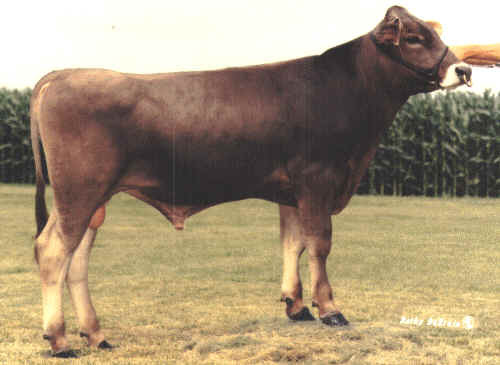 His tall, strong 5E(90) dam lived to be over 17 years of age and had 11 lactations that totaled 233,490 lbs. of milk! 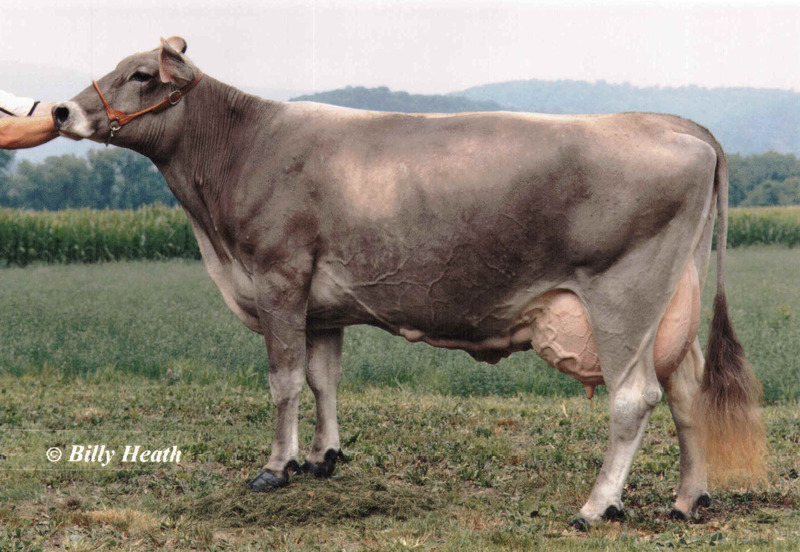 He has sired show winners, including a 1998 All-American and also sires top udders, up to EX(94), including Lolly, pictured below. Jill has world records and is a fifth generation Excellent! You can expect extremely high production potential, early maturity, combined with exceptional longevity from JULIO. Jill's dam is over 9 years old, and Jill's 5E(91) granddam is still alive at over 16 years of age. Jill was the No. 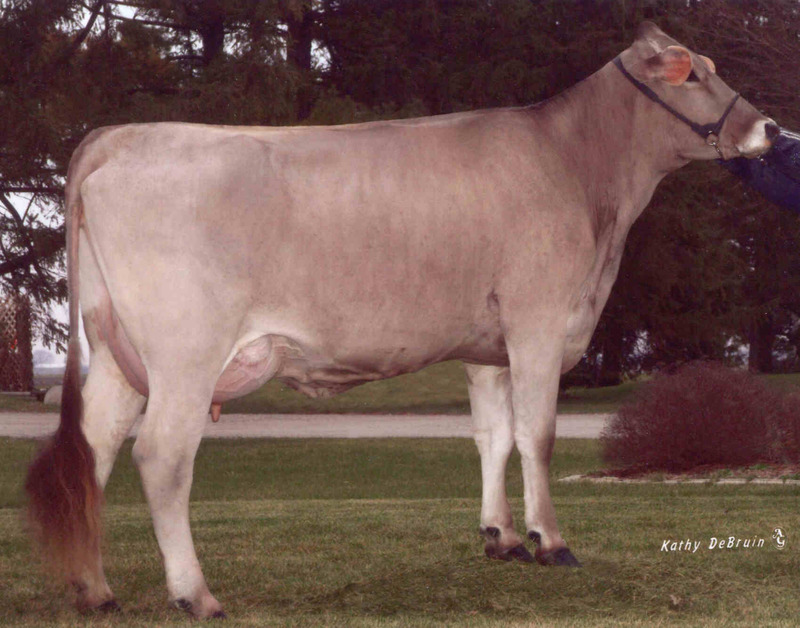 7 cow in the U.S. Brown Swiss Bulletin's Miss Millennium contest. 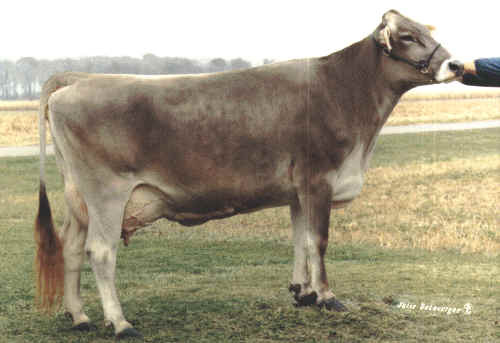 She was the youngest and highest protein cow of the group. Her granddam, Priscilla, was the No. 2 cow! JULIO (pronounced HOO-leo) is Spanish for July, when he was born. Julio Iglesias, JULIO's namesake, the famous romantic singer, is the worldwide leader for record sales. 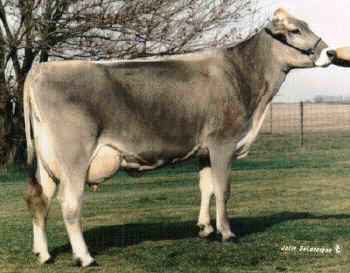 Jill is the World Record Milk and Protein Leader (at 2-yrs). Add a little romance to your herd... plan to use JULIO now! Roll Mead TA JILL-ET, 3E, EX(93), EX(94) Mam.! 1st 5 records over 30,000m , a Br.Swiss World Record! Click here for even more information on Jill... Milk & Component Queen! Bull Contracted to Flatness International, Inc.
Sold for $11,500 at Top Acres Sale, 7/1/98. Embryos now available by ENSIGN and AYTOLA. JILL still has embryos available... see pricing page. 3rd Gen. EXCELLENT, Superior Brood Cow. Lived to over 16 yrs. old! Copyright 2002-17 Flatness International, Inc.